When I think of China, its not the New World Order that comes to mind, or the glittering postmodern skyline of Shanghai, or the ownership of most of the USs debt. I dont think of roasted duck in black-bean sauce, the corner Yuck-in-the-Box, or penny toys my daughter gets in a Happy Meal from McDonalds. I think of the great poets of the Tang Dynasty -- eighth-century scholar-bureaucrats who roamed the vast empire, writing poetic letters to each other and to loved ones at home, tacking them up on a bulletin board in some provincial temple, lamenting their loneliness, chronicling their sojourns through savage and sublime landscapes unrolling at their silk-stockinged feet like painted scrolls of mountains and rivers without end. I think of a sere and exquisite aesthetic, a cultivated refinement that privileged not only the numinous beauty inherent in the universe, but the indwelling good common to all men. Kung-tzu, known to Westerners as Confucius, called this quality jen -- the better nature within all things, including human beings. The practice of art -- indeed, the practice of life -- was to evince this better nature in all things, and create transactions between the universes of spirit and of phenomena. It was jen that whisked the tea, jen that guided the hand in calligraphy, jen that raised the child and governed the kingdom. It was jen that was called forth in ritual, in cookery, and in the strings of a zither plucked by a poets hand as he drank wine and sang to the moon of his solitude. There is something of jen, that inner good, in the Jaton Real A&V-803 speakers ($6000 USD per pair), the flagship product of a new and promising player in the audio world. Jaton Corporation makes the AP2140A Operetta, a 70Wpc class-AB stereo amplifier; the RC2000 Operetta preamp; the Lyra line of stand-mounted speakers (three models); and the MP600 subwoofer -- all products of high value, and likely imbued with that essential Confucian good. Jatons US headquarters are in Northern California, and its products are built in China. I heard the A&V-803s powered by the Operetta stereo amp and driven by the Operetta preamp at the Venetian in Las Vegas, at the 2009 Consumer Electronics Show, and came away very impressed. So when Jeff Fritz, editor-in-chief of the SoundStage! Network, proposed that I review the Jaton Real A&V-803 floorstanders, I agreed. The A&V-803 is a biwirable, three-way, bass-reflex loudspeaker with a claimed sensitivity of 91dB and a frequency response of 35Hz-40kHz. It can be single-wired; the recommended range of amplification is 70-300W. The cabinet measures 45"H x 10"W x 14.5"D, including the base stand (the stand alone measures 4"H x 15.75"W x 14.5"D), and is available in one of four high-gloss finishes: Mahogany, Sandalwood, Walnut, or Dark Walnut. My review samples, in the very handsome Walnut finish, weighed 110 pounds each. The four drivers are proprietary: two 8" woofers, one 5" midrange cone, and one 4" semi-horn-loaded ribbon tweeter. 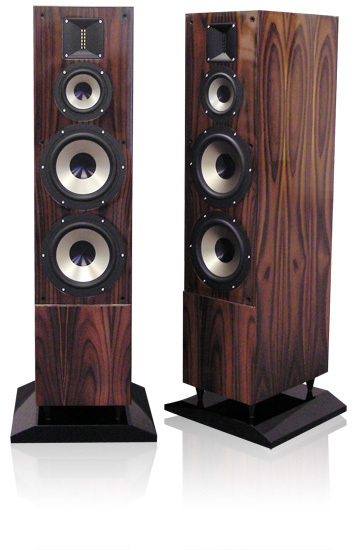 The midrange and woofer cones have a distinctive look: standard black at the center, but banded in a semiglossy silvery-gold from about midway inside to the lip. At first put off by the bulls-eye appearance of the drivers, I played the speakers with their grilles of grayish cloth in place, but in the end grew fond of their striking looks with the grilles off. Each speaker comes with a quartet of smooth, silvery cones that screw into the bottom plate to separate it from the gloss-black base, thus providing rigid support, isolation, and damping. The A&V-803s arrived packed in three sturdy cardboard boxes: one each for the speakers, and one for the two bases. The setup instructions were clear, explicit, and easy to follow -- from unpacking the speakers to screwing the cone feet into the cabinets and the feet to the bases, the entire procedure took about 30 minutes. Simple. Hooking up the A&V-803s to my system proved somewhat more troublesome. The outsized binding posts on the back of each speaker are of a diameter larger than the 1/4" bite of the spades on my Verbatim speaker wires. Curious, I got down on hands and knees to measure the post with a caliper; it came to just over 11mm. Even when I pried my spades open somewhat -- theyre made of a thin gauge of pliant tellurium-copper -- they kept sliding out from under the knurls. I was constantly positioning and tightening, repositioning and retightening -- until I gave up and used Cardas and AudioQuest spade-to-banana adapters: Cardas for the tweeter and midrange drivers, AQ for the woofers. The result was an absolutely unsatisfactory, "tunneled" sound. What to do? I went to my garage and rummaged around in my cardboard treasure chest of spare speaker wires: Analysis Plus Oval 12s with Oval 12 jumpers, Audience Maestro with Audience Au24 jumpers, and separate runs of venerable AudioQuest Midnight 2s and AudioQuest Crystal speaker cables. None was quite right. Then, six weeks into the review period, I pulled out a mint set of internally biwired AudioQuest Midnight 3s, terminated with bananas. These both handled the need for biwiring and got around the problem of the oversized Jaton binding posts. Despite the A&V-803s weight, it was easy to handle them. At first I pushed them on sliders across the hardwood floor of the small parlor where Id set them up, then across the carpeted floors of my living room, and finally walked them into the study, which is also my listening room. I positioned the Jatons pretty much where I normally place my reference Von Schweikert VR5 HSE speakers: sitting on 5/8"-thick MDF boards measuring 12"W x 18"D and about 10 apart, toed in about 10 degrees, the axes of the midrange drivers firing to the outside of each shoulder and the tweeter axes firing slightly to the outside of my ears when I sat at my listening position, which is about 9 from both speakers. Once the Jatons had broken in, a process of about 150-200 hours, I heard no need to adjust those positions. My system consists of: a Cary CD 303/300 CD player; a TW-Acustic Raven Two turntable with Tri-Planar Ultimate Mk.VII tonearm and Zyx Airy 3 moving-coil cartridge (0.24mV output); a Herron VTPH-2 phono stage; Thor TA-1000 Mk.II, deHavilland Mercury 3, and EAR 868 (with phono stage, in for review) preamplifiers; deHavilland KE50A monoblocks (40W, class-A), Electrocompaniet AW220 monoblocks (220W), and a VAC PA-80/80 stereo amplifier (80Wpc); and my Von Schweikert VR5 HSE speakers. For this review, I used Cardas Golden Reference, Cardas Golden Cross, and Verbatim interconnects (RCA); Verbatim speaker cables with jumpers; and the internally biwired AudioQuest Midnight 3 speaker cables already mentioned. Balanced Power Technologys Clean Power Center passive line conditioner fed the phono stage and preamps, and the Cary CD player went straight into the wall with a Fusion Audio Predator power cord. The power amps were plugged into an Isoclean 104 II power strip with Cardas Golden Reference AC cords, the strip itself plugged into the wall with another Golden Reference. Other power cords were Thor Red, Fusion Audio Impulse, and Harmonix XDC Studio Master. I have two dedicated 15A lines, both with Oyaide R1 duplex outlets. I used PS Audio Critical Link fuses in the Cary player and the deHavilland preamp and mono amps. My equipment rack is a five-shelf Box Furniture stand made of lightly finished sapele wood. Except for HRS Nimbus footers and couplers between the stacked Electrocompaniet monoblocks, I used no further isolation other than the various components own stock feet. My listening room is treated with sound panels from Acoustic Sciences Corporation; bookshelves line the right wall, shelves of LPs the left. My study/listening room is fairly small: 15L x 12W x 8.5H. I listened both in the nearfield, and on a couch about 9 away from the plane described by the speakers baffles. Although the Jatons sounded fine with all of my electronics, I thought they sounded best with the VAC PA-80/80 stereo amp, driven by either the deHavilland Mercury 3 line stage or the EAR 868 preamp. In terms of fulsomeness of sound, the 40W deHavilland KE50A monos didnt quite fill the barrel. The Electrocompaniet monos sounded punchy but slightly lacking in depth and organicity. I preferred tube amplification with the Jatons. As far as the preamps were concerned, the deHavilland Mercury 3, both as a line stage and in combination with the Herron VTPH-2 phono stage, had a finesse and airiness with vocal music that I loved, while the EAR 868 had robustness and drive. Despite my pleasant session with them at CES 2009, I at first had some doubts about the Jaton Real A&V-803s. Would they sound bright in my system? Would they have woolly or boomy bass in my smallish listening room? Would they sound plasticky or dry? Or, perhaps worse, would they sound OK but uninvolving? Would they not sound good? After the break-in period, I played both digital and analog recordings, and no matter the format, the Jatons consistently conveyed a pleasing organicity, impressive depth and width of soundstage, and an articulate sonic palette of a variety of instrumental timbres. The midrange was very special, the speaker reproducing tenor and alto saxophones, voices, and violins with superb tone, nimbly and accurately differentiated timbres, and sufficient speed. And though I tried, I heard no holes in the handoffs from woofer to midrange and from midrange to tweeter, suggesting a well-designed crossover and well-matched drivers. Suspecting for some reason that the Real A&V-803s would sound great with jazz, I spun the Joe Lovano Nonets 52nd Street Themes (CD, Blue Note 4 96667 2) on my Cary player. I wasnt wrong. The Jatons brought out a liveliness in the overall sound, Lovano putting some Dexter Gordon bite into the characteristic smoothness of his tenor sax, and the rest of the groups horns harmonizing nicely in the mildly lugubrious post-bop choruses. Throughout "If You Could See Me Now," the Jatons tweeter sounded fast, agile, and smooth. Lewis Nashs stickwork on snare and the crash and ride cymbals was crisp, and sharply defined in space at the left of the soundstage. There was also a marvelous presence to the performance, a quality of immediacy like that of a live performance. Furthermore, there was great depth to pianist John Hickss comping, a soft thump to Nashs kickdrum that I felt in my midsection, and an appropriate and an attractive plumminess to Dennis Irwins double bass. Throughout, the air and space in my smallish room felt fully charged with this music of variegated textures and easygoing drive. The acoustic piano is always a fine test of a speakers timing and capabilities of harmonic saturation and tonal complexity. I next listened to Mozarts Piano Concertos 6, 15, and 27, performed by pianist-conductor Pierre-Laurent Aimard and the Chamber Orchestra of Europe (CD, Warner Classics 2564 62259-2). In the first movement of Concerto 6, Allegro aperto, I heard lovely string tone that was not ragged or hazy but sprightly and vibrant, and sufficiently clear and detailed to tell me that these were strings and not wind instruments. Cellos and double basses were very warm and strong, swelling with energy and presence when called on. But Aimards piano was of course the centerpiece; his trills were deft and sparkling, the Jatons conveying both the crystalline clarity and harmonic richness of the instrument. Early in the review period, before Id decided to remove the grilles from the speakers, Id noticed that, in some orchestral tuttis, the violins could occasionally sound a tad forward, though never verging on true harshness, and strings could sometimes sound brash when I was expecting lushness. More evident before full break-in, this tendency diminished after about 250 hours, but didnt quite disappear either. But even this early in my listening, in the second movement of Concerto 6, Andante un poco adagio -- full of forte passages, and crests and swells in the strings -- the slight zippiness Id heard in the first movement seemed to evaporate, the speakers sounding more even, balanced, and full of nuance. In the end, after returning to this recording again and again, and once Id decided the Jatons sounded much better with their grilles off, Aimards piano tinkled sweetly and with a natural liquidity I thoroughly enjoyed. After becoming more familiar with these speakers, I adjudged them awfully fast -- not, in the main, bright in character at all, but rather modestly warm, and as sweet as they were resolving. In October 2009, at the Canseco Field House, in Indianapolis, I read an elegiac poem Id written for a special tribute to Myles Brand, a friend who had been the president of the National Collegiate Athletic Association, and a great man who, after a struggle with cancer, passed away all too soon. One of the other performers at the tribute was Sylvia McNair, a Metropolitan Opera soprano and a member of Indiana Universitys music faculty. Her Loves Sweet Surrender, a recital of arias from Mozarts operas, performed with Neville Marriner and the Academy of St. Martin-in-the-Fields (CD, Philips 289 446 712-2), came to me as a gift after the event. After hearing McNair sing so movingly onstage in Indianapolis, I played this disc many times once Id returned home. The Real A&V-803s reproduced her lyric soprano with wonderful delicacy and finesse in "Giunse alfin il momento . . . Dei vieni, non tardar," a recitative and aria from Le Nozze di Figaro. They rendered McNairs varied and adept interpretation so completely to my satisfaction that I wanted nothing more from them. There was no breakup during forte passages, no glossiness or overhang or ring to suggest some flaw in the crossover or a tweeter overwhelmed with information, and no slurring of microdynamics in McNairs exquisite tremolos. I did hear a kind of tunnel effect and some overhang to operatic voices with the lower-powered (40W) deHavilland KE50A monoblocks, but once Id replaced the latter with the 80W VAC PA-80/80 stereo amp, those effects disappeared. This told me that the A&V-803s appreciated a little bit of power -- and, indeed, that Jatons recommendation of a minimum of 70W was spot on. The A&V-803s did what they were supposed to: got out of the way and just let me listen, marveling in the beauty of McNairs sublime lyricism. Staying with female vocals but switching to English folk-rock, I spun a track from Fairport Conventions Unhalfbricking (CD, Hannibal HNCD 4418), a 1969 album with the late Sandy Denny on lead vocals and the virtuoso Richard Thompson on guitar. "Who Knows Where the Time Goes," written by Denny but more popularly associated with American folksinger Judy Collins, is a mournful, quietly stirring folk-rock lament. On this version, Dennys voice is like a nearly invisible fire of flared, single-malt Scotch -- warm, airy, and just a little husky with peat. Theres strength to it even in its aura of evanescence, and the Real A&V-803s captured all of it -- the gentle drive of Dennys breathy alto as it lilts and lofts over Thompsons trilling electric-guitar accompaniment, the solemn undercurrent of a Scottish march time carried tastefully by the soft cymbal-chatter and martial rattle of drums, rolling bass, and strummed rhythm guitar. A lovely blend of acoustic and electric elements rendered in satisfying timbres, this recording showed how capable and thrilling the Jatons were in creating a soundstage that not only enveloped the listening space, but made that lovely illusion of instruments and vocalist -- heres that audiophile word again -- palpable within it. I wasnt just lightly intrigued or moderately involved -- I was mesmerized. One characteristic that showed up from time to time through the Reals, with recordings that themselves were a bit bright, was a tendency for the speakers to sound somewhat forward. The country-rock classic "Hot Burrito #1," written by Gram Parsons and Chris Hillman in their heyday with the Flying Burrito Brothers, and performed by the Mavericks on Return of the Grievous Angel: A Tribute to Gram Parsons (Almo Sounds AMSD-80024), did indeed sound hot -- not the performance itself, but the recording. Raul Malos soaring lead vocal sounded overdriven and a bit in-my-face. The A&V-803 wasnt what Id call a forgiving speaker -- it masked no harshness in a given recording. Older classical CDs -- such as EMIs Great Artists of the Century series (which are mostly digital transfers of older analog recordings), or just plain bad ones (such as almost any Tallis Scholars disc on the Gimell label) -- sounded much the same through the Jatons: a bit etched and edgy, the ribbon tweeters perhaps picking up the overabundance of high-frequency information on these early or flawed digital recordings. Removing the grilles alleviated some of this, as they seemed to consistently bottle up the highs. I strongly suggest using the grilles as attractive protection for the drivers while idle, but removing when the speakers are in use. Yet other recordings, such as early digital transfers of 1970s analog recordings, came through wonderfully. "My Yellow Ginger Lei," an old hapa-haole (sung half in English, half in Hawaiian) song written by John Keawehawaii and performed as a choral piece by the six high-tenor voices of the Makaha Sons of Niihau, sounded light and airy as a breeze making a soft au`ana hula through Waikiki. Both Kamakawiwoole brothers, the famed Israel (Braddah Iz) and the elder Skippy, sing on this tune, joined by four more tenors in this seminal band from the Native Hawaiian Renaissance. Accompanying themselves on guitars, standup bass, and ukulele, the Makaha Sons choral harmonies seemed more like subtly blended floral perfumes than voices, light as winds with the scent of home: "My heart is yearning for you, / My awapuhi . . ." The Jaton speakers were capable of presenting multiple voices in close harmony without turning them into a surfy hash or veiling them in a haze of mild incoherence. What came through was music open and clear as the flat, calm waters of a lagoon. With pure analog recordings, the sound was much the same: the Real A&V-803s produced tonal saturations, expanses of soundstage, and an alluring organicity that sometimes had me shaking my head. "I Cant Get Started," that old jazz standard, never sounded so fabulous as when I heard it through the A&V-803s. In the version by Charles Mingus and the Jazz Workshop (LP, United Artists UAL 4036), John Handys solo alto sax was possessed of something both achingly friable and yet chthonic, a solo song of the earth, rocking on its haunches and warbling from an enduring mystery, intoning messages intended for all the good within us. I got up and cued this track again and again, playing the music as if it were a lapping tide I could step into repeatedly. I compared the Jaton Real A&V-803s with my Von Schweikert VR5 HSE speakers ($15,000 per pair, when available). The Jatons couldnt reach as deeply (the VR5s go down to 20Hz), or produce the swift, well-defined, dramatic drumstrokes the Von Schweikerts are capable of with orchestral recordings like Stravinskys The Rite of Spring, performed by Valery Gergiev and the Kirov Orchestra (CD, Philips 289 468035-2) -- they just didnt have that kind of slam. But the Jatons soundstaging was definitely deeper and wider, and that depth and width felt more organic, too -- a spacious stage filled with instruments that, though not absolutely sharply defined in terms of sonic image, arranged themselves within it, appropriately spaced and located. The music spread out taller, wider, and more deeply than with the VR5 HSEs. And much like the VS speakers, the Jatons cabinets were not inert, but imparted a pleasing tone that was ever so slightly warm and sweet. Jazz and classical piano sounded especially vibrant and full of harmonic overtones and saturated timbres. The Jaton Real A&V-803s possessed that indefinable quality of pure musicality to such a degree that I found myself regretting that my time with them was coming to an end. Different and perhaps technically less capable than my reference Von Schweikerts, the Jatons, fed sufficient power by the amp(s), nonetheless had a sweet coherence that never failed to produce music, no matter the genre. Add to these fine sonic qualities their eminently affordable price, and it seems a no-brainer that I should strongly recommend the A&V-803s. Though they may not excel at anything you can point to right away (their strong soundstaging notwithstanding), and though their oversized binding posts may prove vexing to some, these handsome speakers are capable of being captivating in ways that, through the pure enjoyment of music, might just bring out the latent goodness within you and without you.